The mild weather this past winter is expected to lead to one of the worst tick population explosions in years. These tiny, blood-sucking pests can cause untold misery, and carry all kinds of diseases, the most common being Lyme disease. While they usually feed on rodents, a inadequate rodent population will cause them to turn to larger prey: most notably humans, outdoor pets, horses and livestock. In the past, your only choice for tick protection was chemical pesticides, which we know can create their own problems. 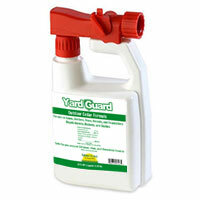 Today, we can offer you a safe and natural way to prevent tick invasion – our Yard Guard cedar spray. To apply Yard Guard, use our Ready to Use quart spray bottle, or any adjustable hose-end sprayer set to 1 or 1 ½ oz/gallon of water. A quart will cover about 3-5,000 square feet. Ticks often like to sit on low branches of trees and bushes so they can jump on passing people or animals. So make sure you spray branches and tree trunks up to at least 4 feet high. For more product and application information visit our Yard Guard page on this site. Protect yourself and your family from ticks! Try Yard Guard today.